A Providing relevant information and data on the biochemical basis of disease. B Assisting the clinician in confirmation of or exclusion of a presumptive clinical diagnosis and monitor patients response to treatment. C Understanding teaching and training of both medical and paramedical staff at both undergraduate and post graduate levels. 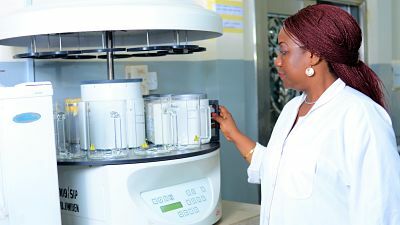 Students from the school of Medicine, Dentistry, Medical Laboratory Technology and Health Technology as well as undergraduates from other Universities on Industrial training are accommodated at various times /periods. Post-graduate students are mainly Resident Doctors who are training to be Pathologists. D Raising funds for the hospital from fees paid by patients for assay of their samples sent by clinicians. 11 Serum amylase and urine amylase. The University of Benin Teaching Hospital Cancer Registry commenced effective data collection in January 2008. The Hospital Cancer Registry Committee was inaugurated by the then Chief Medical Director of the Hospital, Professor E. E. Okpere in 2007. The Committee was headed by the then Chairman, Medical Advisory Committee, Professor M.O. Ibadin with Professor M.N. Okobia as the Co-ordinator and Dr. D.E. Obaseki as Deputy Coordinator. The Committee held a series of meetings and carried out feasibility studies between October and December 2007. A cancer registry sensitization workshop was organized on September 6, 2007 at the premises of the hospital.UBTH CANCER REGISTRY Is Also A Member Of The MDT. (Multi-Disciplinary Team) For Cancer Management In The Hospital. The immediate area covered by the Benin cancer registry is the Benin-City metropolis and its surrounding environment. Benin-City is located in Edo state of Nigeria. There are 3 senatorial districts in Edo state which include: (I) Edo south senatorial district (II) Edo central senatorial district and (III) Edo north senatorial district. According to the 2006 population census, Edo state has a geographic land mass area of 17450 km2 with a population of 3,218,332 which comprises of 1,640,461 males and 1,577,871 females. The demography of Benin-City is cosmopolitan, with majority as the Binis and a substantial population of Ibos, Yorubas, Hausas, Esans, Urhobos and people of other neighbouring ethnicity. The major religions include Christianity, Islam and African traditional religion. view pdf A and pdf B to know more about cancer Registry In UBTH.